Rabbits impact Australian agriculture, ecological communities and 321 nationally threatened species. The RHD Boost project began in 2009 and sought to identify new RHDV variants with superior lethality to rabbits with partial protection from endemic Australian Rabbit Calicivirus (RCV-A1) and immunity and/or genetic resistance to infection with existing Australian Czech 351 derived RHDV variants. Thirty-eight RHDV variants and RHDV-like viruses were imported and evaluated as part of this work. Seven of these were selected for further testing, and as a result a Korean strain of rabbit haemorrhagic disease virus, known as RHDV1-K5, was recommended for release in to Australia as it showed an ability to overcome the partial protection offered by the endemic benign calicivirus RCV-A1 – see the final report here. It is important to note that as part of this work, the current vaccine, Cylap was tested for efficacy against RHDV1 K5, of which is showed to be able to provide protection against this strain – see the Read and Kirkland 2017 paper. Following extensive preparations for a community-led component, the project recruited 323 community release sites in addition to the 18 intensively-monitored sites (of which 9 were release sites). In March 2017, the project culminated with the release of RHDV1-K5, the first national release of a new rabbit biocontrol agent in 20 years creation. At the same time, the project also formed a National Rabbit Biocontrol Monitoring Program which has been able to track virus impact across Australia. A complicating factor during the project was the incursion of a new rabbit virus, RHDV2 in mid-2015. RHDV2 reduced rabbit numbers by 60% at 8 of the 18 intensively-monitored sites, making it much harder to show additional reductions in rabbit numbers at these sites, post RHDV1-K5 release. Preliminary data analysis from the RHDV1 K5 release has shown a national average reduction of 36% post release, with further data anlysis to be done which will include a state by state breakdown. The intensively-monitored sites showed no significant change in quarterly rabbit growth rate following the release. As part of the National Rabbit Biocontrol Monitoring Program, laboratory tools were developed to determine the impact of different viruses, including RHDV1-K5 and RHDV2. On-line rabbit-specific disease observation tools (embedded within RabbitScan) allowed participants within the community release sites to track of the spread of RHDV1 K5 through the rabbit population. Analysis showed that RHDV1-K5 appears to work as a biocide; it is effective at a local scale, but generally does not spread like a self-disseminating biocontrol agent does. The project also showed that community monitoring is a powerful tool to mobilise individuals and groups and extend the reach of a research project far beyond what is possible with traditional science approaches. Another component of the project was to select additional RHDV strains for future release. The project team was able to demonstrate that experimental selection of a novel strain with an altered surface protein and different immunological properties was possible, however, attempts to further select this strain for the ability to overcome immunity to existing RHDV strains were unsuccessful. Developing and maintaining the National Rabbit Biocontrol Monitoring Program is essential to understand movement and mapping of rabbit viruses within Australia and collect long term datasets. Support for an ongoing pipeline of tools for rabbit management is critical in adding biocontrol solutions to the rabbit management toolkit. Community-led initiatives engage and motivate stakeholders to take action in rabbit management and also in the process of monitoring and providing feedback for alert systems, providing broader community, ecological and environmental benefits. Rabbit populations are cyclical and peak around Spring and Summer with young rabbits on the ground. Rabbit biocontrol can be most beneficial if applied as part of an integrated and complementary pest management approach. 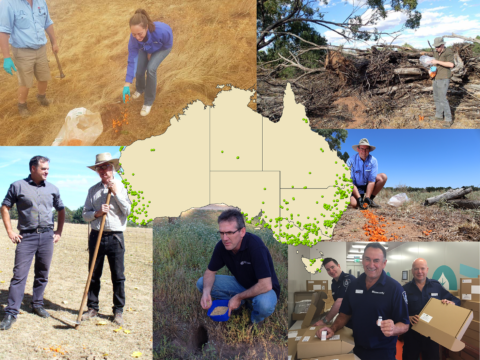 The outcomes from the national RHDV1 K5 release will help inform researchers and land managers on RHDV1 K5’s place as part of integrated rabbit management. It is highly recommended that RHDV1 K5 be released in Autumn months, when less young rabbits are on the ground. RHDV1 K5 is available to purchase as a commercial product but is classified as a Schedule 4 restricted chemical product and can only be supplied to persons who are authorised to use the product under the laws of their state or territory. Farmers and land managers should continue to follow the evidence-based recommendations and implement coordinated, well designed warren ripping programs at a landscape scale where possible, integrated with other control measures. We strongly recommend that you work with your local land service and biosecurity staff in your region to discuss next steps as this approach can successfully reduce and maintain rabbit populations at low levels. Further information about conventional rabbit control tools can also be found on pestsmart.org.au and by following the links to the rabbit portal. The Centre for Invasive Species Solutions is continuing research into new and innovative way of controlling rabbits at a landscape scale. This includes assessing the viability of RHDV2 as a rabbit bicontrol agent, which is currently not registered for use in Australia under the APVMA requirements. Any registration of RHDV2 will incorporate the development of a vaccine for domestic and precious rabbits and researchers are working on this. There has been excellent progress to date, and documentation is being prepared for submission to APVMA for a pilot “standalone” RHDV2 vaccine. Once submitted, the proposal will be assessed by the APVMA. Once all regulatory requirements are met, the commercial vaccine manufacturer will be able to commence production of a pilot batch. As it is unknown how long these processes will take, it is currently not possible to provide an estimate of when this vaccine will be available to the public. Research to develop a multi-valent vaccine that would provide protection against both RHDV1 and RHDV2 strains, is ongoing. It is still recommended by veterinarians that all pet rabbits are vaccinated with Cylap® to protect against RHDV. This success of this program was a result of a major collaboration the Australian Government, all state and territory governments, the CSIRO and the livestock industry through Meat and Livestock Australia (MLA) and Australian Wool Innovation (AWI), and Rabbit Free Australia through the Centre for Invasive Species Solutions (formerly the Invasive Animals CRC through the Australian Government CRC Business Programme).